The capital of New South Wales, Sydney is a vibrant and cosmopolitan city. Sydney overlooks a spectacular bay and is home to a very busy port. On the edge of the harbor near the Circular Quay, is located The Rocks – the place that hosted the first European settlement in Australia. There are streets with colorful buildings that house restaurants, shops and other commercial activities. 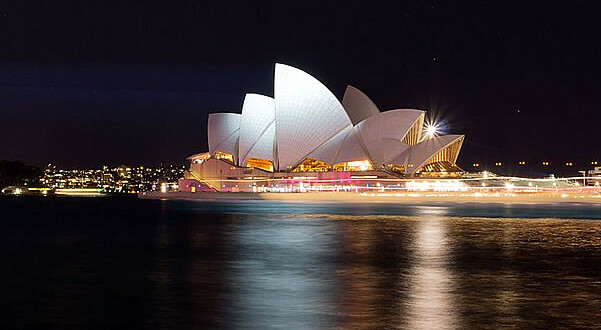 Among the buildings that characterize the city there are the famous Sydney Harbour Bridge and the Sydney Opera House. The central business district offers fantastic opportunities for Christmas shopping from stylish Castlereagh Street and Elizabeth Street to the Queen Victoria Building and bustling Pitt Street. Even at Darling Harbour which is just a few minutes from the center of the city there are countless opportunities for shopping. The districts of Potts Point, Kings Cross, Darlinghurst and Balmain are famous for good restaurants, entertainment and shopping. During Christmas Sydney has much to offer: The interactive Christmas Tree and Christmas Projections in Martin Place, several concerts and street choirs in every corner of the city. The QVB Swarovski Christmas Tree adorned with beautiful sparkling crystals under the Queen Victoria Building’s magestic dome. The Magic Cave at David Jones Department Store. Experience Santa’s highest grotto – 250 metres above Sydney at Sydney Tower Eye. Hunter Valley Gardens Christmas Lights Spectacular. Experiencing the Gardens during the day and then seeing the lights at night. Food and beverage stalls, Ferris Wheel, Swing Chair, Carousel, Super Slide and Inflatable zones. Opening: 2 November 2018 – 26 January 2019. Opening Hours: (Closed 25th December) Gardens open daily 9am – 4pm, lights open 5.30pm – 10pm. Lights of Christmas at St Mary’s Cathedral Square. A spectacular free sound and light show every night. Christmas Wonderland at Sydney Showground. Dazzling lights festooned in the summer sky, festive carnival rides whizzing by, Christmas cheer by the sleighload and a touch of Christmas magic will have you and your family drifting off to a wondrous winter wonderland. Sydney Santa Spectacular. Sydney’s biggest and arguably the most festive Christmas festival returns to Rosehill Gardens Racecourse. Snow World Ice Skating on one of Australia’s Largest Mobile Ice Skate Rink. Elves Village Art Center. Interactive Enchanted Forest. Australia’s Only Double Decker Carousel. Chippendale Christmas Market. Location: Sutherland Lane behind Something for Jess café (SFJ) – 27 Abercrombie St, Chippendale. The market will host 15 curated boutiques including a selection of vegan friendly vendors and many more talented Australian creatives. Stroll down to Something for Jess café and wander through the stalls of the first ever Chippendale Christmas Market! Each stall has been curated with quality over quantity in mind. A selection of 15 boutiques highlight some of Sydney’s leading artistic brands and designers. Brands include Ellery, White Rabbit Gallery, AryPlants, Soins Du Corps, Millie Hall designs, Hammerhead threads and Heart in Ceramics. First 100 people to arrive at Something for Jess cafe will receive a FREE vegan gift hamper! All proceeds from the sale of water bottles go to Maggie’s Rescue. We look forward to celebrating with you! Opening: 9 December 2018. Opening Hours: 11am – 3pm. Eryldene’s Christmas Fair (Eryldene Historic House and Garden, 17 McIntosh Street, Gordon NSW 2072). This Christmas fair takes place in Eryldene – a historic house in the Sydney North Shore suburb of Gordon, designed by the Australian architect William Hardy Wilson. The market offers a wide selection of unusual and quality gifts. The market consists of about 50 stallholders displaying jewellery, antiques, Christmas hampers, jams and preserves, cakes and puddings, silk ware, garden ornaments, plants, homewares, children’s and women’s clothing, toys, pearls and paper products. Opening: 24 November – 25 November 2018. Opening Hours: 10am to 4pm. Christmas on George Street (Christmas on George Street, 424/430 George St, Sydney NSW 2000, Australia). Events and activities along George Street from King Street to Market Street. The George Street Christmas program will create a festival atmosphere celebrating one of Sydney’s best known shopping precincts. George Street has everything from homewares to handbags, technology to toys and food to fashion. The event will also be characterized by festive lighting and a nine metre high Christmas tree. Opening: We are waiting for the 2018 dates. Opening Hours: Mondays to Wednesdays and Saturdays, 10am to 6pm. Thursdays, 10am to 9pm. Fridays, 10am to 7pm. Sundays, 10am to 5pm. Organization: Transport for NSW CBD Coordination Office with support from the City of Sydney, Office of the NSW Small Business Commissioner. Lindesay Christmas Gift Fair (Lindesay, 1 Carthona Avenue, Darling Point, NSW 2027). This Christmas fair run for 3 days. The fair consists of 80 stalls both inside the house and in marquees set in its beautiful gardens. The exhibitors of the fair have a wide variety of stunning clothing, jewellery, linen, gift and gourmet food stalls will be available just in time for the festive season. A complimentary shuttle bus service will run from Edgecliff Station – top level of Edgecliff railway station bus interchange (Stand H) – from 10:00 AM – 4:00 PM to Lindesay. Opening: 17 November 2018. Opening Hours: 10am to 4pm.